Kate Gleason’s name is so familiar in Rochester and at Rochester Institute of Technology – where the College of Engineering is named for her – that it can obscure her many and varied accomplishments. She built more than 100 homes in East Rochester, became a bank president and held numerous positions at Gleason Works, a business started by her father, William. An exhibit commemorating the 150th birthday of Gleason opens at RIT’s Wallace Center on Nov. 19, displaying photos, gears and other items from the engineering pioneer. 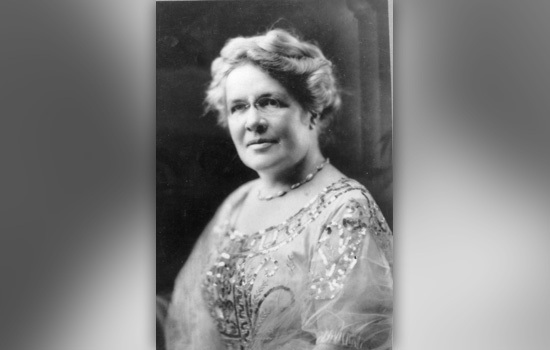 Born in Rochester on Nov. 25, 1865, Gleason grew up around her father’s machine shop. In 1884, she became the first woman to enroll in Cornell University’s Sibley College of Engineering and Mechanic Arts. She became an entrepreneur and innovator who was internationally recognized for her skills in business promotion and community development as well as philanthropic endeavors. She was known for traveling widely and for entertaining in her home, including hosting the 86th and final birthday party for Susan B. Anthony in 1906. The exhibit, “Kate Gleason, Visionary: a tribute on her 150th birthday,” was organized by faculty in the museum studies program in RIT’s College of Liberal Arts, including Professor Tina Olsin Lent, museum studies program chair, and Professor Rebecca Edwards, chair of the department of history. They were joined by Juilee Decker and Rebecca DeRoo from the department of performing arts and visual culture, Michael Brown from the department of history, and university archivist Becky Simmons. The team examined documents, letters, newspaper clippings, photographs and digital files in order to select material for the on-site and online exhibitions. Two of the items on display include a bevel gear (on loan from Gleason Corporation) and a silver tea set, showing the various achievements of Rochester’s “first lady of gearing” and philanthropist. Other items on display include photographs from the East Rochester Department of Local History that examine Gleason’s endeavors in manufacturing and building. Copies of the 2010 book, The Life and Letters of Kate Gleason by Janis F. Gleason will be available for purchase during the opening reception, from 5-6:30 p.m. on Nov 19. Janis Gleason is the wife of James Gleason, Kate’s grandnephew. Visitors to the exhibit can collect newly-created trading cards that describe other facets of her accomplishments, such as her commitment to suffrage and innovation, fashion, building and manufacturing. In addition, a mobile display will appear at several other locations on the RIT campus during the last week of November and the first week of December and an exhibition website has been created as a supplementary resource. It features links to footage of home movies created by Kate Gleason that document home life and travels. The exhibit, which will be in the Sunken Gallery on the second floor of the Wallace Center through Dec. 18, is the third installment of the series, “Exhibitions Across the Curriculum” established by RIT’s museum studies program in 2014. For more information, visit https://kates150th.wordpress.com/ or follow the museum studies program on Twitter @RITmuse. To learn more about the museum studies program, see here: http://www.rit.edu/cla/museumstudies/.